Seeking an offshore Drupal developer for your project? CSSChopper is a renowned Drupal development company from India providing extensive web solutions in many countries. We let you hire dedicated Drupal developer to complete your projects in the stipulated time frame. Our developers are highly experienced and well-versed to handle from simple to complex projects and provide appropriate solutions at your disposal. They employ leading technologies to provide you the best outcomes of your investments. 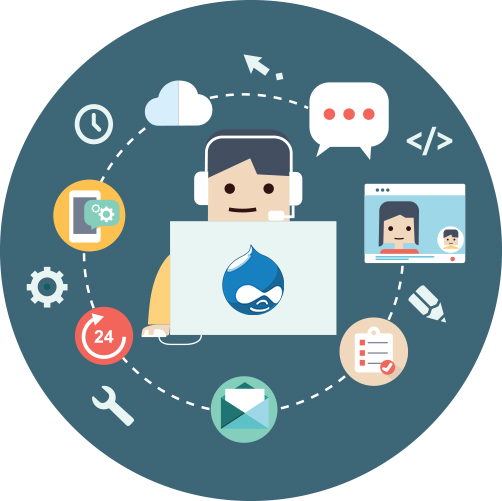 We have a large team of passionate Drupal developers who are proficient at delivering cutting-edge solutions on or before the deadline. The team is smart enough to make use of the diverse functions and features of Drupal effectively to provide the optimal results for our clientele. By harnessing the power of modern web technologies, we come up with innovative ideas and build outstanding web portals and online software for customers globally. To provide comfort and ease of development to our customers, we have arrangement of means of communication: chat, phone, email, and Skype. Our PMS system enables clients to coordinate with team, monitor work progress, and streamline the work. For delivery of any project, we provide three options: full-time (21 working days, 40 weekly hours reaching 168 hours in a month), weekly (40 hours), and bucket hours TM (one year validity) . You can opt any of our packages as per your requirements and needs. Once you hire our professionals they will look after the project and build every component optimally to give you an engaging and viable website with amazing features. Drupal leverage many features that provide extended functionality, our developers know all ins and outs of this CMS and they can utilize its features to the fullest to craft out-of-the-box web solutions. Besides our PMS system, we provide daily reports, BaseCamp, Jira, Trello, etc. to track project. BEST DRUPAL DEVELOPMENT SERVICES ARE HERE! Get a completely interactive website with extensive features through custom web development. We provide quality custom development services to give you the best out of your investment. With our conversion service, you can get your PSD design or layout converted to website theme and design. Our talented professionals make your dream come true to have an amazing website. Enrich your website feel and look with a custom website theme. 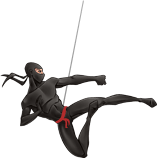 Our expert web developers can create highly interactive and quality themes for your site. We provide instant support and quick maintenance for any kind of application issues. With our rapid support service, you can easily resolve your problems and get assistance. Hire our skilled developers for complete migration service to Drupal CMS. We can migrate your other CMS based website to Drupal and also to upper version of Drupal as well. Want to develop a website on Drupal from scratch? Hire dedicated Drupal developer from CSSChopper, and get an amazing website for your business. Hire dedicated Drupal professional to build custom modules for your project or create extensions or plugins to extend functionality of your website. Build an interactive store or create an ecommerce website for your business with the help of experienced and talented web developers from CSSChopper. WHAT ARE OUR UNIQUE SELLING POINTS? We utilize agile methodologies of web development and effective approaches for rendering quality and rapid solutions for our clients. Security is one of the key concerns of people looking for digital solutions. We want to assure you that our processes are completely secured with appropriate security measures. Once we have set up an accurate delivery deadline, we schedule our work so as to achieve our target deadline. Hence, we work hard to deliver your project on stipulated time to give a delightful experience. To help you communicate with us easily, we have provided several channels like chat, call, Skype, email, and PMS, through which you are able to connect with us and share your experience. We believe in innovation and make something unique for our customers. Hence, with thorough barnstorming we envision various solutions to choose the best one for our clients. As a full-service web development company not only we provide extensive digital solutions, but also answer your queries and resolve your problems. We are always available to help you. Having worked for different industries our developers can serve for various businesses including Banking & finance, Travel & tourism, Government, Corporate, Start-ups, and so on. By adding the top extensions and plugins, our team of developers make sure to build outclass websites that come with an elegant appearance and lots of features. UI design and overall user experience are essential components of a site. Using leading tools & techniques, our developers build optimized UI/UX design for smoother user interaction. Using an appropriate plugin, we integrate effective chatbot service on your site that enables your customers to access resources & information on your site about your products. Our innovative approaches help you get alive your dreams. From building an e-commerce store to developing a simple blogging website, you can hire our Drupal developers for all kinds of custom work. As you hire us for website development, our experts dedicatedly work on it and craft various features and components, making the most responsive & user-friendly website. Our developers make a perfect blend of their skills and experience to carve out incredible custom themes for your website that give your site a unique and enticing appearance. Our ardent Drupal developers work with result-oriented methods ensuring definite success of your project. Our developers provide solutions that comply with latest coding standards and development styles. They integrate state-of-the-art features to craft leading solutions. Security is key to every web portal. Our Drupal experts make sure to build a highly protected web portal that utilizes technologies like, HTTPS, Data encryption, SSL, etc. You can discuss with us about a new project or redesigning work on your existing site. Just fill out the form available on our site giving details like name, contact, email, and query. You can also attach any file if you have regarding the project. Finally, post the inquiry. After receiving your query, we will go through your project to evaluate it. Our team of expert Drupal developers will examine the project and contact you to give details about the project. When you are satisfied with the details, you can ask us to go ahead. You will find a list of available developers on our site from which you can select appropriate developer(s) for your project. For your satisfaction, you can put queries pertaining to your project. When satisfied, you can hire Drupal developer and pay for service. After hiring the developer(s), you don’t need to worry just hand over your project and our experts will start working on it. Our professionals are quite talented and they have a good experience, hence they will finish your work on time with quality.